It is possible to stay right here at the farm and just take in the scenery, view the available sales horses, get lessons, or visit the many horse related activities in Ocala and Central Florida. Our farm is located in the Golden Corridor of the North West area of Ocala, close to HITS, the famous Live Oak Driving competition, Longwood farm polo and other competitions, clinics and many other events. At the same time, we are close to shopping, dining and other entertainment. 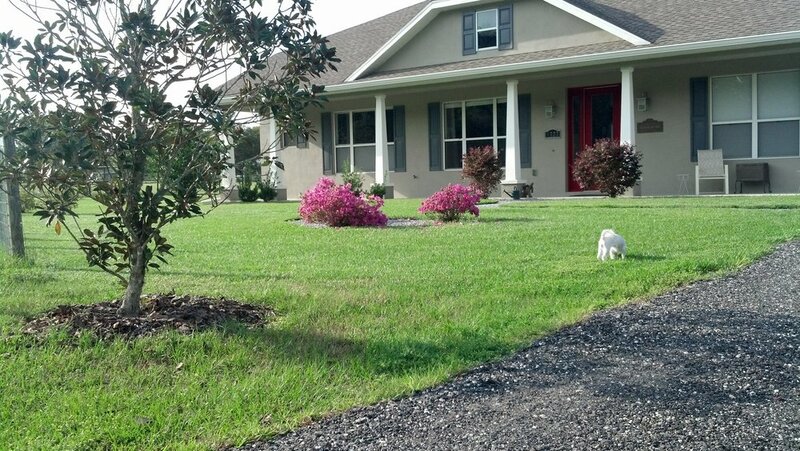 The street right around our farm gives a taste of old Florida. As our guest you will stay in your own private area with separate entrance. Scroll down to see pictures that give an impression of our farm and the amenities. Just contact us for more information! Dutch Dream Farm is a wonderful peaceful place! A stay here is so restful and relaxing. I enjoyed everything about this place - from the delicious piping hot coffee in the morning to the wonderful conversations (especially when Winnie and Hope shared my chair!). A disclaimer... I have never stayed with someone I didn’t already know and I was a bit nervous when I arrived. I definitely stepped out of my comfort zone ... but I am so glad I did! Rianne made my stay at the farm so comfortable. Although I arrived as a stranger I like to think I departed as a friend! Thank you for being such a terrific host, Rianne!! Had a wonderful stay at Dutch Dream Farm! Plenty of hospitality and such a quiet, beautiful setting. Mornings in Ocala are heavenly. I will return as often as I can! Thank you so much Rianne - you made my stay here very easy and comfortable. It was great to have the minis and the big boys right there. It’s a beautiful and warm place! I thoroughly enjoyed my stay, you have such a beautiful farm and you are such an amazing person. I had such a relaxing time. I am so happy to have made a new friend! I look forward to coming back to see you. If you are ever in South Florida - please come visit me! My stay at Dutch Dream Farm was such an absolute pleasure. What a lovely, tranquil and serene place! I could spend hours gazing out your bay windows at Uzeo with the gorgeous hazy Florida sunrises and sunsets in the background. It has been lovely chatting with you and thank you for introducing me to your boys (Uzeo and crew) and letting me love on Winnie and Fluffy. I am already looking forward to my next stay! Thank you so much for letting me stay here. The animals were wonderful to be around and the quiet atmosphere was perfect after a long day of studying! "Dutch Dream Farm is a little piece of heaven. My stay was so peaceful, the horses are incredible and Rianne has the gift of hospitality! A wonderful experience while I was studying. I would definitely recommend anyone to stay here at the Dutch Dream. My training is hard work and to come home to the farm is a true blessing. I will be back!" Dr. J. Gerardi., DVM CVA, Kindred-Canines In Motion (KIM). “I spent one glorious night at Dutch Dream Farm and so wish I could be here for a week! Rianne is so friendly and we have a lot in common! Lovely home, horses and dogs! You have a special place! Thank you for letting me come and stay with you on such short notice.